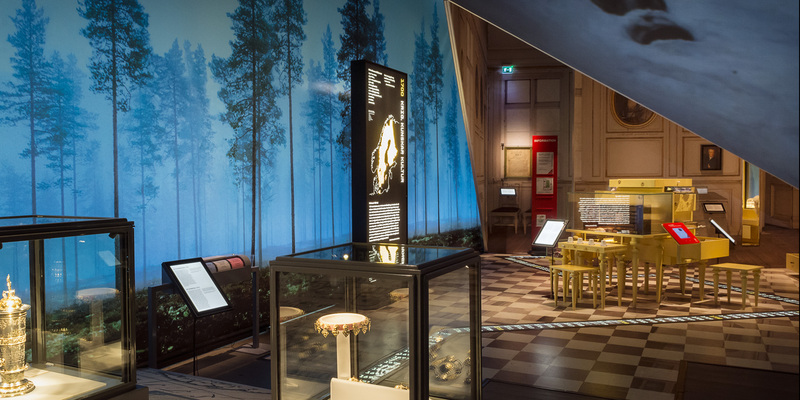 The exhibition “History of Sweden” is a concentration of events and personal destinies from the 11th century down to the present day. Influential men and women are highlighted, as well as class struggles, minorities and immigrants, all of whom have made their mark on history. The exhibition has a chronological axis, with each century individually presented. The various rooms have educational stations. The History of Sweden is an introduction to the other exhibitions on the 1st floor. You will find the exhibition History of Sweden on the first floor. 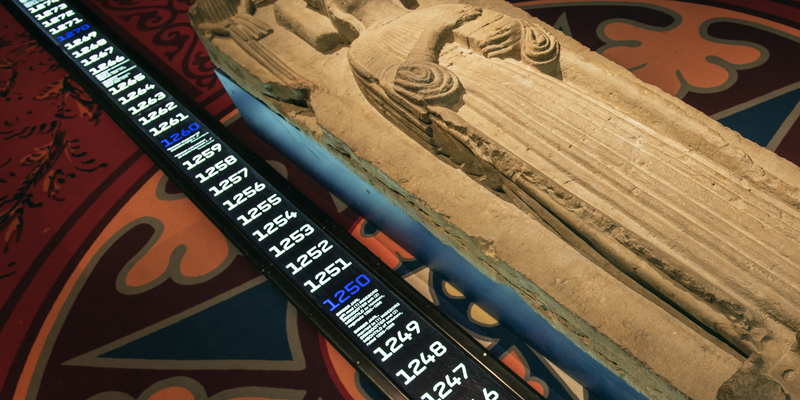 This exhibition takes the 11th century as its starting point. The monarchy at that time was not hereditary, and various clans jockeyed for the throne. The first king to have himself baptised into the new faith, Christianity, was Olof Skötkonung. Oak reliquary, overdrawn with gilded copper, Västergötland, Eriksberg Church, c. 1175. In the first part of the exhibition, the 12th century, you will see splendid objects such as silver chalices and a gilded reliquary from Eriksberg in Västergötland, resembling a church building. Things like this were used by the Church in rituals witnessed by the newly converted population. 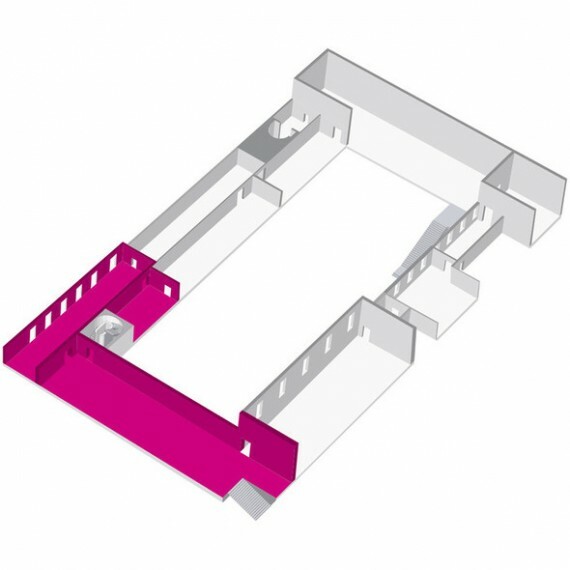 Reliquaries contained relics of saints – perhaps a bone, hair or fingernails. 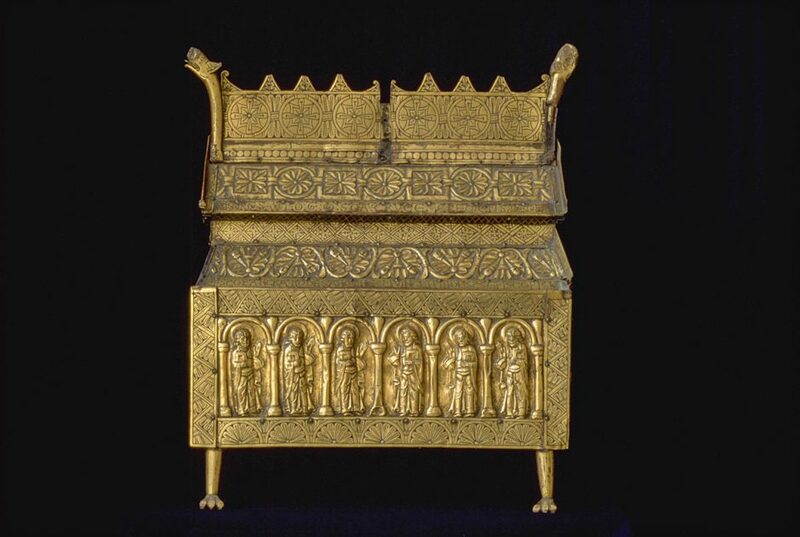 The Eriksberg reliquary may have been presented to the church by King Knut Eriksson or his clan at the end of the 12th century, perhaps as a way of consolidating the clan’s position. You can also see a number of artefacts from Finland, found in the town of Sigtuna. During the 12th century the Svea kings went on crusade to Finland, which became Swedish, remaining so until 1809. In the 13th century we encounter Queen Katarina Sunesdotter, whose tomb chest is the best-preserved from medieval Sweden. When widowed, she withdrew to Gudhem Convent in Västergötland, to which she bequeathed the greater part of her fortune. Notice too the contemporary depiction of a horseman, an iron helmet and one of the world’s oldest and best-preserved cannon, found in Skåne. This cannon weighs just over 9 kg and is only 30 cm long. It could be used for firing both arrows and projectiles filled with scrap metal (canister shot). The same room contains the unique gold brooch retrieved from the town river of Motala and made in France, Paris possibly, at the beginning of the 14th century. It was found in the river by an eel fisher some centuries later. One interpretation is that this may have been part of the dowry of Queen Blanka of Namur (in present-day Belgium) at the time of her marriage to King Magnus Eriksson in 1335. 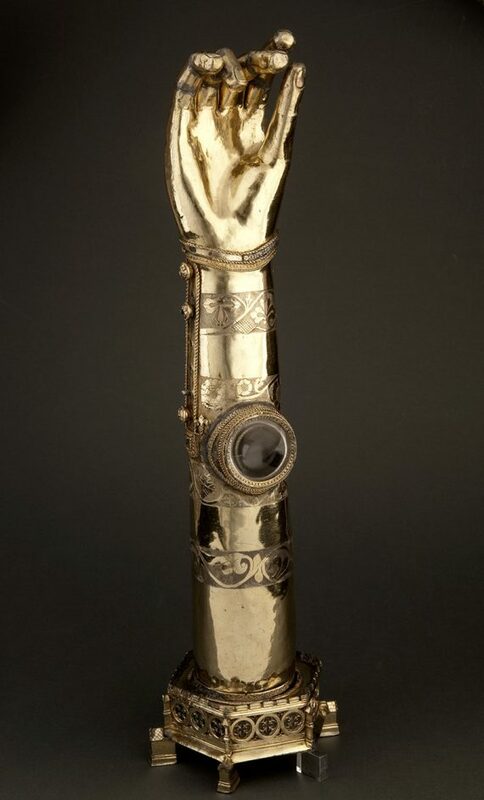 Silver gilt reliquary for a finger bone of St Bridget, Östergötland, Linköping Cathedral, 1400-1450. Politically, the 14th century was a troubled time of internecine strife in Sweden. Pirates infested the Baltic, and the country was hit by one of Europe’s worst-ever disasters, the Black Death. At this point, one of the greatest characters in Swedish history, St Bridget (1303-1373), appeared on the scene. She became an international celebrity and has been made the patron saint of Europe. She was canonised in 1391, and during the 15th century the Bridgettine convent in Vadstena became a cultural centre for the entire Nordic area and the parent convent of an order which exists to this day. The exhibition features textiles, rings, seals, a reliquary and an altarpiece, all of which have to do with St Bridget. 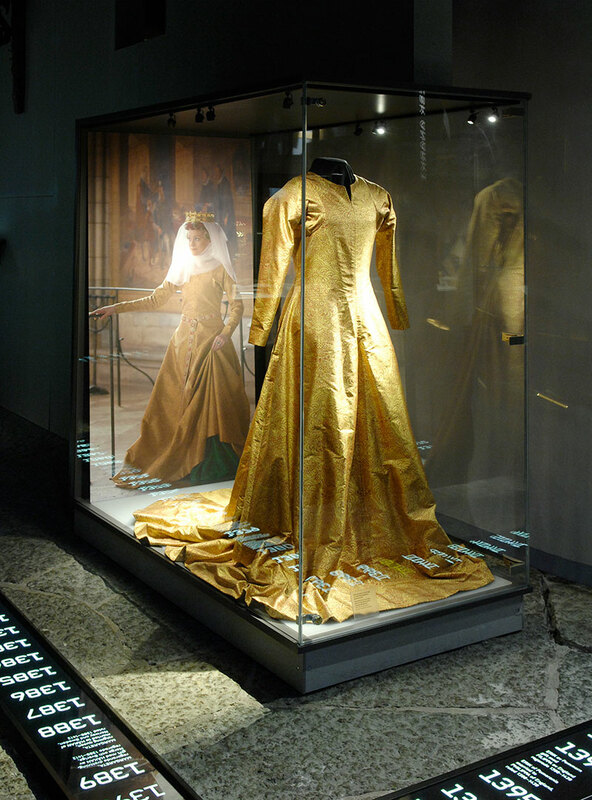 In this exhibition you can see a copy of a gown to Margareta, the powerful Queen of the Kalmar Union. At the end of the 14th century she became ruler over Norway, Sweden and Denmark. Here you can also see a hunting horn that was made for Erik of Pomerania, Margareta’s chosen successor. In addition, the exhibition features the Ängsö Goblet formerly belonging to King Karl Knutsson (Bonde) and pieces of his 15th century velvet funeral costume. Copy of Queen Margaret’s gown. The original, of woven cloth of gold, belongs to Uppsala Cathedral Museum, 15th century. The medieval towns were important nodal points for trade, trans-Baltic trade not least. There are exhibits here illustrating local crafts in the town, but also imported altarpieces, textiles and pottery. King Gustav Vasa (1496-1560) has influenced the people of Sweden more than any other ruler through the ages. He made Sweden a hereditary monarchy, established a central government and founded a Protestant Church based on the teachings of Martin Luther and with himself as its head. Many churches probably buried their gold and silver to avoid having to surrender them to the King, who needed these precious things to finance the build-up of the new nation state’s economy. Buried silver from churches in Småland, Västergötland and Jämtland is included in this exhibition. Gustav Vasa’s Reformation probably cost Anna Reinholdsdotter Leuhusen her position as Mother Superior of the Klara (Clarisssan) Convent in Stockholm. Her heavy gold chain is on display here. During the 17th century, Sweden became a major power, royal armies fought their way through half Europe and the Baltic became a Swedish inland sea. The wars were successful from Sweden’s point of view and yielded huge quantities of booty, e.g. from the Baltic countries, Poland and Germany (some of them are on display in the Gold Room). 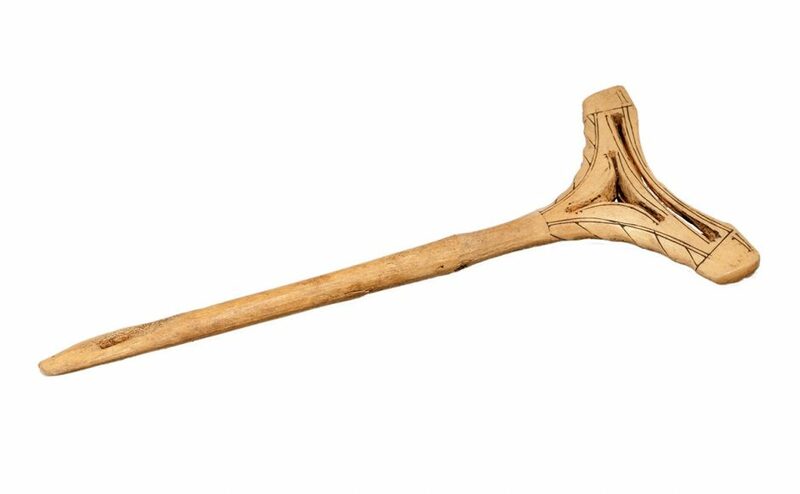 Saami drum hammer, made of antler from Nasafjäll, Lappland, (Arjeplog), 1600-1800. During the same time the state also colonised the Saami territories (Sapmi) within Sweden. The exhibition show a few objects from the extraction of silver in the mines of Nasafjäll in Lappland. A drum hammer found suggests that the Saami population of Nasafjäll continued practising their traditional religion. For the Saami, the opening of the silver mine spelt forcible recruitment, e.g. for heavy transport operations. The Swedish state’s colonisation of Lappland was not only an economic affair: Saami culture came under heavy pressure at the same time. The 18th century opened with a fearful bloodletting, when over 200,000 soldiers died in the wars of King Karl XII and the country was impoverished. Several of the provinces conquered earlier were now lost, and Sweden’s “Age of Greatness” was over. In this exhibition you can see debased coinage struck during the wars of Karl XII. Contacts with the outside world gradually became more peaceable, and a new interest in science can be seen in the so-called cabinet of curiosities on display here, dating from the 1740s. This contained natural objects such as fossils, shells and plants. Imported textiles with exotic motifs and the practices of tobacco-smoking and coffee-drinking became popular. Sweden joined in the European network of trading companies basing their operations on colonialism and slavery. The 19th century was a time of upheaval, with further contacts with the world at large. Sweden lost the eastern half of the kingdom, Finland, to the Russian Empire in 1809. The exhibition shows a new class society accompanying the rise of industrialism, with great gaps between rich and poor. Artefacts from a croft in Halland and from a settlement belonging to travellers in Bohuslän are on display here. Written records shed little light on the position of travellers in Bohuslän, and the exhibits are the only ones thitherto collected from a traveller settlement. Feminism took shape and gained strength. A pioneer highlighted here is Fredrika Bremer, an author and debater of international standing. In the mid-19th century she pleaded for women’s entitlement to education and wanted to introduce both day nurseries and infant schools. The exhibition ends with a summing up of events in the 20th century and reflections on the contemporary scene.